The University of Denver Ranking is as the joint 88th best college in the USA by the USNews, and the 139th best by Forbes. Other large colleges in Colorado include the University of Denver, Colorado State University, Colorado School of Mines, University of Colorado – Boulder, Colorado College, Regis University, University of Northern Colorado, and Colorado Mesa University. The total composite University of Denver SAT Score range (verbal plus math; middle 50%) for accepted applicants is 1100 to 1320. The requirements for ACT (25th-75th percentile) at Composite are 25 to 30. 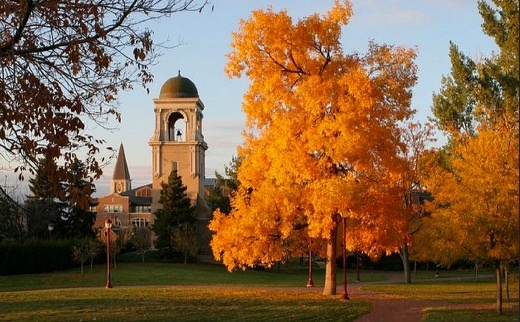 The University of Denver tuition fees are $42,090 for both in-state and out of state students. It is a moderately selective college accepting 77%% of applicants. 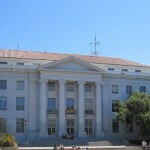 Financial aid offered totals $86 million per year, an average of $32,460 per student. The University of Denver is a private establishment situated in a city locale in the city of Denver, CO. Presently, there are a total of 11,778 students at Denver. Of these, 5,517 (47%) learn at the UG level, while 6,261 (53%) take postgrad courses. At the undergraduate level, 5,129 take classes full time whilst 388 are there part time. Photograph of the University of Denver by Great Degree. Geographically, 50% come from instate while 50% are from out of state. There are around 9% of undergraduates from overseas. There are 3,018 women attending DU as undergrads, while 2,499 men study at that level, making the ratio around 45:55 male:female. With regards to diversity, the undergraduate student body can be broken down to 68% Caucasian, 4% of Asian descent, 3% black, and 9% with Hispanic or Latino backgrounds. The academic establishment is presently rated as the joint 88th best in the states by the U.S. News College Report. The costs of tuition for attending this academic establishment is $42,090 (including admin fees) for those from both in and out of state. It will cost a further $11,307 for university accommodation and food, $1,800 for books, and $978 in admin fees. This brings the total cost of attending at this establishment to $55,197. DU provides needs based funding for scholarships of $54.4 million, and non-needs fund of $31.8 million are available, making a total of $86.2 million accessible as scholarships to their scholars. Average financial aid received by each student is $32,460, and around 84% of students are provided with assistance for their money needs. University of Denver is a moderately selective establishment with an acceptance rate of 76.7%. In the previous year 10,504 applied to attend, of which 7,160 were admitted. Of those receiving admittance letters 1,243 (17.4%) matriculated to the university. The cost to apply to the college is $60 for both UG and PG study. Of the students accepted for admittance, 45% were placed in the best 10% at their high school. Forty-four percent of future students presented SAT scores. The mid scores for reading were 500 – 699 (77%), 600 – 699 (48%) for Math, and 500 – 699 (79%) for writing. The middle fifty percent percentiles were 550 – 660 for reading, 560 – 670 at Math, and 540 – 640 for writing. Seventy-five percent of students submitted ACTs: mid ranges are 24 – 29 (58%) for Composite, 24 – 29 (47%) for English, and 24 – 29 (61%) for Math. The 25 to 75% percentiles were 25 – 30 Composite, 25 – 30 for Math, 25 – 32 English, 8 – 9 for Writing. The imperative factors for gaining entrance into the institution are Secondary school record, and Standardized test scores. Other important aspects for entrance include Essay, Interview, Extracurricular activities, Talent/ability, Personality, and Recommendations. The address for applications to the UD is 2199 S. University Blvd Denver, CO 80208. The admissions phone number is (800) 525-9495, and their admissions site is located here (http://www.du.edu/prospectivestudents/index.html). 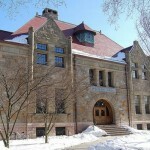 The school proffers over 100 undergraduate degrees and has over 120 graduate programs. The most popular UG degree courses are Business, Management, & Marketing (35%), Social Sciences (17%), Visual and Performing Arts (8%), and Biological sciences (7%). Class sizes are: less than 20 (50%), 20 to 49 (44%), and 50 and more (6%). The main campus is situated in the ‘University Neighborhood’ of Denver and covers an area of 125 acres. Sports teams compete at the NCAA Division I level of several conferences including the Summit League, the National Collegiate Hockey Conference, and the Big East Conference. The teams are named the Pioneers. Men are involved in eight varsity events, while women take part in nine, thus competing in a total of 17 varsity events. The college employs in the region of 1,284 full time and 656 part time faculty (giving a total of 1,940 faculty). The student to teacher ratio is 11:1. Around 67% of new undergraduates graduate the school within 4 years, and 74% complete within six years. Last year, 3,692 students graduated; these obtained 1,272 Bachelor’s degrees, 1,947 at the Master’s level, and 473 Doctorate’s degrees.